In case you haven’t noticed, we’ve got a lot of things in the works around Impossible HQ and the blog lately. We’re releasing a fitness program in a few weeks, and over the weekend we murdered our servers from last week’s post (thanks to Jeff for un-murdering them), but that’s not all. Today we’re announcing 2 new impossible things: you ready? This is going to be fun. A key thread throughout everything we do here an HQ is focused on giving and service. There’s a couple reasons for this, but the main one is that at some point through your own journey, you come to the realization that you’ve gotten a free lunch or two throughout life and you haven’t done it all on your own. Whether it’s being born in the right country, or having a family, teacher or boss that backed you up at a key moment- there was something at some point that set you off that wasn’t your doing. Somewhere along the lines you had help. And while, doing the impossible is tough – and you have to want it bad sometimes – if you pick your head up for a few seconds and look around every now and then, you start to realize how much you’ve been able to accomplish, how many abilities and opportunities you do have. You realize how many possibilities you have. You realize how good you have it, and no matter how hard you think things are, you’re aware of how many possibilities you DO Have, how precious they are and foolish it is to waste them. You want to create possibilities for others. At some point, someone opened a door for you, dropped a key and showed you that somethings was possible. When you realize that, you start looking for your own ways to create possibilities, to effect change and drop some more keys for others. We spend a lot of time talking about creating more possibilities in our own lives, but over the next few months, we’re going to have a chance to create some possibility in the lives of others through a very unique opportunity. A few months ago, an organization called Pencils of Promise called me up. As the blog has grown, I’ve gotten approached by a ton of businesses trying to do “deals.” A lot of of organizations, businesses, and entrepreneurs that want to do JVs/partnerships/affiliate deals that take advantage of the Impossible brand and I simply won’t do it. I’ve turned down 100% of those opportunities until PoP called. I talked to Rachele and Erin and they explained to me that 67 million children in the world live without access to education. Something we all take for granted and complain that it’s mandatory for 16 years is something not even available to millions of kids around the globe. They don’t get the option to choose to push their limits, live an adventure, because for them, it’s impossible for them to get something as simple as an education. Pencils of Promise wants to change that. “A Pencil”, the child answered. So Adam reached into his bag, pulled out a pencil and gave the child one. He traveled and handed out more pencils, but that answer stuck in the back of his mind. So he decided to do something more about it. Starting with $25 in 2008, and focused on giving my students the possibility of education, PoP has gone on to build over 50 schools in Laos, Nicaragua and Guatemala in conjunction with local communities by hiring local staff and required participation from the communities as they track each student’s success. If we don’t love what we do, then we are doing something wrong. We must profoundly understand local cultures before we can hope to improve their educational opportunities. Our most important partners are the communities themselves. We build more than just four walls: we foster lasting and sustainable education. Innovation, collaboration and creativity are at our core. We are dedicated to the long-term sustainability of each project we support. 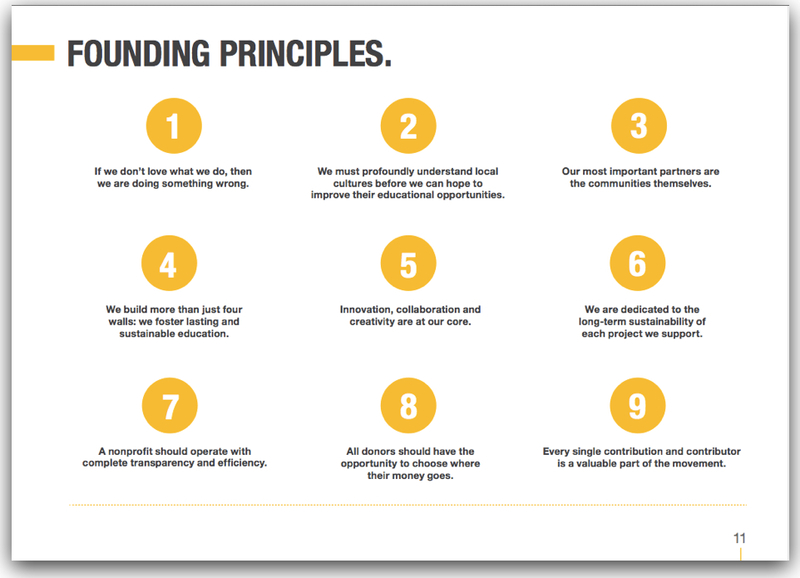 A nonprofit should operate with complete transparency and efficiency. All donors should have the opportunity to choose where their money goes. Every single contribution and contributor is a valuable part of the movement. The emphasis in the paragraphs above are mine. There are lots of organizations that simply throw money at problems and hope they go away without actually understanding them, but partnering with a community and developing change inside-out is what drew me to PoP – their focus on sustainability throughout each project. There are 67 million children in the world without access to education. For them, going to school is impossible. Literally. PoP has built 50 schools over the past few years and over the next few months, they want to build 50 more – a goal that’s seemingly impossible (in fact, they’re calling it their “impossible ones” campaign – I told them I’d allow them to use the word ;)). Since doing the Impossible is kinda our thing, I thought to myself, “So what are we going to do about it?” How can we as a community contribute? We’re going to raise $25,000 as a community by the end of 2012 in order to build an IMPOSSIBLE school and provide the possibility of education to 1,000 students. First reaction: Woah! $25,000? That’s a ton of money! Yes it is. So why $25,000? $25,000 builds a school in Guatemala and provides the possibility of education to approximately 1,000 students. It’s big, it’s scary and it’s just enough that we might not be able to do it. But it’s not just about me (it never is). The “we” is where you come in. In the League, we’ve got a group that’s donating to Kiva. Almost lent a little over $8,100 to entrepreneurs all over the globe (and counting), but as we’ve talked, we wanted to do something more. We wanted a community challenge – one that would have an effect that you could feel, touch, see and experience – and that we could all be in together. Well, you wanted a challenge? We got a challenge. As a community our goal is $25,000 by the end of 2012 in order to build a school in Guatemala and provide access to education for 1,000 students. If When, we hit that goal, we will celebrate enthusiastically, but the person who helps raise the most amount of money will come with me to Guatemala and actually help build the school that we’re fundraising for. Yes, We’re going to actually help build the freaking school. Raising money is one thing. It’s cool to “know” theoretically that you helped contribute to actually build a school and provide a entire community with education. It’s another thing entirely to actually go there, help out through the process and build the school with your own two hands while looking into the eyes of the people who’s lives you’re able to affect in a positive way. Doing stuff like this is what this blog and Impossible HQ are about – doing. We’ll actually go to Guatemala, help people push their own limits and do the impossible by providing a possibility for education, while living an adventure ourselves and giving back. That’s like a win-win-win situation. Triple boom. After I ran a marathon: 26.2 miles in my Vibrams, I never thought I’d do it again. One marathon. Checked off. Done. Boom. That was it….at least I thought so… But then I kept thinking….what if? I kept coming across stuff from people like Dean Karnazes and David Goggins and these crazy, stupid, impossible ultra marathons kept staring me in the face – asking me to do more – all the while daring me to try. Over the past two years I learned I’m not very good at turning down dares. I couldn’t let that challenge stare at me and dare me like that without knowing if I could actually do it. So while walking around Portland a few weeks back, I put down my money, signed up and started training. I’m doing something crazy. I’m running an ultra marathon in Chicago on October 27th. There’s been a few things that have been tough, and then a few that have HURT – and a marathon hurt – but I’m going farther. I’m running the Chicago Ultramarathon – my first ultra marathon ever – and checking it off my list while raising money for our school. It’s going to be really, really hard, and a little crazy, but it’s absolutely going to be worth it. Donate here. It’s pretty simple. 1,000 people. $25 dollars/person. That’s all it takes. BOOM. Donate here. The cyclists and triathletes around the league have been bugging me for jerseys forever (you know who you are!) And, I’ve been listening! 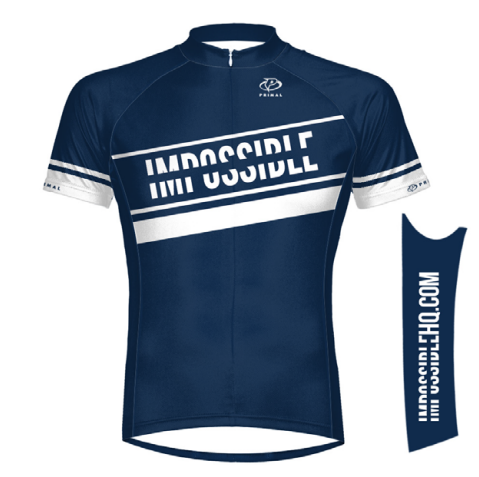 In fact, starting now, we’re doing a (a one-time only) pre-order for the next two weeks of a special run of impossible cycling jerseys. I’m not sure if we’ll ever do these again (design + production + orders + shipping for jerseys is way tougher than typical apparel!). But for the next few weeks, they’ll be available for pre-order. $10% of the revenue from the sale will go directly to POP. If you’re a triathlete or a cyclist, this is an incredible piece of apparel from Primal Cycling and help the fundraising effort (plus they look a little like superhero outfits (if I do say so myself)). Grab your Limited Edition Cycling Jersey Here. In July, I did the GORUCK Challenge – one of the toughest things I’ve ever done in my life. After talking with GORUCK HQ, we’ve tentatively arranged a custom GORUCK IMPOSSIBLE Challenge in Chicago. If 30 people sign up for the class we’ll raise about 2,000 directly for POP, (plus GRC will send about $400 to Green Beret – just because they’re nice like that). We need at least 20 and won’t take more than 30 people for this. If you’re interested, sign up here. Create your own impossible challenge – not just something, you think you might be able to do. Pick something that scares you, that pushes your limits – that you might fail at. Then go do it, tell people about it and contribute to the Impossible School fund. Bonus #2: If you’ve got an event or something in your area that you’d like to utilize to help rally people to raise money for our Impossible school – let me know at joel [at] impossiblehq [dot] com. The math is simple. If 1,000 people donate $25, we’re done. Boom. We hit our goal easily. I know for a fact that we have a community of readers that number much, much more than 1,000 people – there’s no question about that. How many doers do we have? Here’s your chance to put your money where your eyeballs are and literally change people’s lives. With a few minutes of your time and some spare change, you can give someone the opportunity that’s so prevalent in your own life that you probably take it for granted. Do things that haven’t been done before – Russell Kirsch. Here’s your chance: Let’s build an Impossible school. The campaign is called the Impossible ones. Check out the launch video featuring footage from our bungee jump, me and Sophia Bush (as well as a few other people). $25,000 is a massive goal, it’s scary and big enough that we just might not be able to pull it off – still we’re going to try like hell and we’ve already got a head start on it. After our Plummet at the Summit bungee jump in July, the team at Bungee.com pledged $1,000 from the event directly to our Impossible school. Thank you Casey! The one reason you should join and be a part of this: You have so many possibilities available to you. You GET to to choose to push your limits, live an adventureand do something impossible. There’s a huge portion of the world that doesn’t get that opportunity. To them, impossible is basic stuff: clean water, an education…a chance. Whether you realize it or not, when you help other people expand their limits, you not only get to experience how capable they are, but how much more capable you are as well. Lets do this. (I just put in $100 myself) Lets build an Impossible school. I’ve only read half of this and I just had to comment and say the idea of it makes me sick. Which means…I”M IN! I don’t know the first thing about anything like this which makes it even better. I’m in! I AM IN! In hindsight I probably would’ve been better off if I’d read the whole thing. I could’ve tweeted it right and emailed you and all of that. BUT having said that, I’m going to do a fundraiser! I’ve got a venue already, meeting with the owner tomorrow. I have no idea what the event will be, but consider it done! I’ll look into the fundraising end of it, how I want to set that up a bit later. Will report back on the event! This might be hard to believe after your encounter with Russell the other day but this is probably the coolest thing you have done yet! Love this. I’m in 1000%. Quick question, should we donate on your page, or set up pages of our own that go to ImpossibleHQ? If you’re creating your own challenge and raising money, you can create your own and link it to the Impossible HQ group. If you’d just like to donate, you can donate to my page. As always, you make it effortless to take action. In your words… BOOM. I just dropped $15 on a fattening lunch and somewhere there is another human being….same as me, no different….who has a dream of owning a pencil!!!!! We are all the same, we share the same planet….borders, religious beliefs, politics…those are all things that we have created to impose differences that don’t really exist. Take those imaginary things away and we are the same, period. If you are connected with being a human being at all you must care at some level about humanity as a whole. You have moved me, I am in. Just thinking of how many ways I can be in! Step 1 – donate $25 – done. Step 2 – order cycling jersey – done. JOEL!!! THIS IS AWESOME!!!! I just went on a week long mission trip down in Guatemala, and let me tell you, this is definitely needed!!! I am from Grand Rapids, Michigan, and we have a pretty big ministry down there and I think that this school is an awesome thing!!! Why are we classifying this as ‘Impossible’? Every year, my daughter’s school take teams of High School kids to either Kenya or Cambodia to work with orphanages & schools on construction projects etc to raise the quality of life for underprivileged kids & their families. Each student has to raise $1000 in addition to the cost of their airfare. The school, as a community, also run fundraisers to provide cash to send across to put into the projects as buying materials locally is, not only culturally better, but also cheaper & supports the local economy. Most years, all up, they raise about $60k. This is just a small local school! Let’s raise our sights people. Rather than just raising funds for one school, how about we try for 10 (or maybe even 20). You have fans all around the world, Joel. How hard can this be? Supporting PoP is a great idea. Lending via Kiva is cool but with PoP there’s a tangible result plus the long-term impact and that’s what I think is most inspiring about it. Good luck on the ultra. Will you be doing the 50k or 50M? Love this, and their Founding Principles. Count me in. Awesome “impossible” POSSIBLE Challenge. Let’s do it y’all! Waiting on some customer payments, as soon as they show up I’m pushing the Donate button. Another group that appears to get it is All Hands Volunteers (formerly known as Hands On Disaster Response). Check out http://hands.org. Haven’t gone on one of their missions yet but I plan to within the next couple years. Joel this is incredible man. Your commitment is inspiring. And I know and understand it is not about you. But this post alone has immediately forced me to step back and start questioning my own choices. How can I go beyond myself? Yes, there is the obvious. I already donated. But that isn’t enough (we both know this). It is easy to click a button put in my debit card number and transfer a few dollars. There is something deep here man. I have heard of this charity group before on another blog. Definitely love their story and what they’re all about. And love that you’re so big on giving, too! have always admired you from day one.. I remember reading EARLY blog posts talking about not being sure what you were doing (with the blog) and if it’ll go anywhere. Ha! You have literally done the impossible with your blog alone.. and so many other things. love it! This is awesome, Joel. I just made a goal of my own to donate to 100 treps on Kiva (credit to you for the idea). This will serve as my first of many loans. Keep it up! Actually, misread this initially so it won’t serve as my first loan but a pure donation 🙂 Don’t worry though I joined the League and made my first loan, too! I am in! Donating later today and ordering shirt, too. How about this: immediate goal is to raise the $ to build 1 school. But the challenge is also to see if we can raise the funds to build 2 schools by the end of October and the funds to raise another by Christmas? Is that too ambitious? If you have followers around the world, and many of them will be having fundraisers, isn’t that a do-able goal? Here’s a post I got in my newsfeed on fb. Hopefully for most of you guys it won’t be necessary, but just something for you to ponder as you give. Love this idea! When are you thinking the Chicago GoRuck will be. As someone who is also doing their first ultramarathon next month (50 miles), I need to plan around that so that I can train properly. I hear ya on the “crazy” aspect of the ultra, but I’m pumped about the challenge! End of October/Early November for GORUCK. Question: can others besides the person who raises the most also go to Guatemala to help build the school? It depends. I’ve gotten a lot of questions like this, but we need to be sensitive to the needs of the community and flooding the school with a bunch of americans show up trying to help. We’re going to work with PoP to see if we can figure something out, but at this point in the game – it’s too early to say. I’ve been reading your site for awhile and love everything you do here. This is the first time I have felt inspired enough to comment and to take action on something that won’t just benefit me personally. I am a yoga teacher, and have been looking for a reason to create a benefit yoga event, and you just gave me one! I also have plans (nothing concrete yet) to travel to Guatemala in 2013, and would love to become a further part of this. Everything you do is freaking awesome. I’ll be contacting you within the next couple of weeks, because I’d love to promote this blog as well as raise money for a school. Did my little bit with a $25 donation.